COLEOSTACHYS Adr. Juss., Ann. Sci. Bot., Sér. 2, 13: 329. 1840.—Type: C. genipifolia Adr. Juss. Shrub or treelet 1.5–4 m tall; stipules large (1.5–4 cm long), intrapetiolar, the members of a pair completely and smoothly connate, enclosing apex of shoot before its elongation, mostly deciduous before the subtending leaf; leaves eglandular. Inflorescence an elongated axillary spike with 1 node bearing a pair of stipule-like bracts, the flowers lacking both peduncle and pedicel, immediately subtended by the eglandular persistent bract and bracteoles, non-decussate or proximally decussate and distally not consistently so. Sepals leaving outermost petal exposed in enlarging bud, all eglandular, short-connate at base; corolla bilaterally symmetrical, the posterior petal larger than the lateral 4 and erect; petals white, abaxially sericeous in center, the posterior also sparsely sericeous adaxially on claw and base of limb; lateral petals entire; androecium radially symmetrical; stamens 10, all fertile, glabrous except for hairs at adaxial base of filaments; filaments distinct, subequal; anthers alike, very large, thick, dehiscing by oblique apical or subapical pores, the locules unwinged, the connective not identifiably distinct from the locules and not exceeding the locules; pollen radially symmetrical, 3-colporate; receptacle bearing straight basifixed hairs on both sides of androecium; gynoecium radially symmetrical; ovary with the 3 carpels distinct, all fertile; styles 3, attached ventrally at base of carpel, slender and subulate with minute apical stigmas. Fruit dry, comprising 3 cocci borne on a flat torus; cocci subspheroidal, unwinged, smooth, indehiscent, the wall when immature thin and very brittle; mature cocci not seen. Chromosome number unknown. 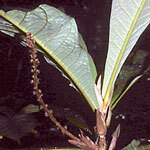 This genus is notable for its spicate inflorescence (unique in the family) and large poricidal anthers; similar anthers are known in some Old World Malpighiaceae (Acridocarpus, Tristellateia), but in no other New World genus. The distinct carpels growing into smooth cocci resemble those of the other members of this clade, Acmanthera and Pterandra. Reference: See the protologue, cited above. Etymology: The name Coleostachys is from the Greek words for sheath (koleos) and spike (stachys); the intrapetiolar stipules and bracts at the base of the spike combine to give the impression of a sheath.